Edward VII dies on May 6th and is succeeded by George V.
3 foot gauge railway built from the pits at Redlake to the drying sheds at Cantrell (Bittaford) – 8 miles long. No 1 machine stops production. Sold to Colthrop Mill, Thatcham. Allen family sells Stowford Mill, Stowford Lodge, Gas Works, Lower Mill and Engineers Shop to the Clapperton Syndicate. Purchase price £30,000. 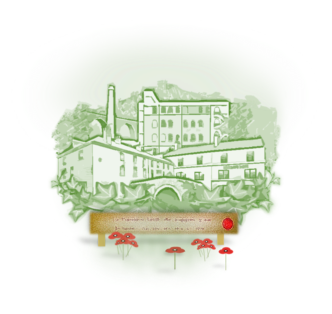 Mill becomes limited company John Allen and Sons (Ivybridge) Ltd. Excise Number 191. Stowford Lodge was a Residential Country Club. National Insurance Act provides cover against sickness and unemployment – December. Redlake Railway opened 11 September. Devon School of Gardening started by Miss May Crooke. Range of Papers – Laid and wove, cream and azure. Brands include Dartmoor Loan, Ivy Glen Linen and John Allen and Sons Super Fine. Sinking of the Titanic with a loss of 1,503 lives. New vicarage built in Blachford Road (not The Chantry, which was the original vicarage, in Beacon Road, in early Victorian times). Weighbridge installed at Stowford Mill. Dartmoor Foxhounds opening meet at Stowford Mill in October on paddock at rear of the Mill. Suffragette Emily Davison is killed by the King’s horse in the Derby race. The Great Womens Suffrage Pilgrimage picnic in Victoria Park, Ivybridge on their way from Cornwall to London in June. Cadleigh House converted by French nuns to provide a school and chapel. Now known as St Austins Priory. The Archduke Franz Ferdinand of Austria was assassinated in Sarajevo on 28th June. War Declared at 11pm 4th August. It was originally known as the Great War. “The lamps are going out all over Europe, we shall not see them lit again in our lifetime”. Model T Ford sells more than all other makes combined. Work at Redlake China Clay pits ceased for duration of the war. Ivybridge Constitutional Club opens. Includes Library and Reading Room. Mill stallion hidden in yard north of the Walled Garden to evade requisition for the war effort. Horizontal Uniflow Engine installed (scrapped 1955). First use of poison gas in warfare. Belgian refugees accommodated at Rutt Cottage in February. 1,000 sandbags sent to the front from Ivybridge in September. New choir stalls and mosaic pavement fitted at St John’s Church in October. Request for funds for V A Hospitals in the area in December. Devon School of Gardening entertain children with tea and games at Stowford Lodge. Introduction of British Summer Time to encourage wartime production. 3,300 sandbags have now been sent to the front from Ivybridge by September. A British Airship crashed near Ivybridge in September. The pilot survived. It was 143 feet long. Butterbrook reservoir – Harford Moor. Lloyds bank opens in Ivybridge. Richard Clapperton becomes Mill Manager as his father retires. United States of America enters WW1. Food Crisis (⅔ food imported). Suppy boats sunk by German U Boats. Devon School of Gardening closes in February. Stowford Lodge opens as V A Auxillary Hospital in December. Armistice Day. On 11th November at 5am an armistice with Germany was signed in a railroad carriage at Compiègne. On ‘the eleventh hour of the eleventh day of the eleventh month’ a ceasfire came into effect. There were 44 losses in Ivybridge. Limited number of women are given the vote for the first time. Work at Redlake China Clay pits resumed. Treaty of Versailles, signed on June 28 1919, was the peace settlement between Germany and the Allied Powers that officially ended World War I. Lady Astor MP is first woman to take her seat in Parliament representing Plymouth Sutton. V A Auxiliary Hospital at Stowford Lodge closes in January. New Dryer No 2 Machine. Stowford Mill production 1389 tons. Spanish flu killed up to 100 million worldwide. Women at Oxford University are allowed to receive degrees. Ivybridge WI starts with 100 members. Council expresses concern at growth of motor traffic. 7mph speed limit proposed.